IAF launches airstrikes on ten targets in Gaza, in retaliation for the endless rocket attacks on southern Israel. 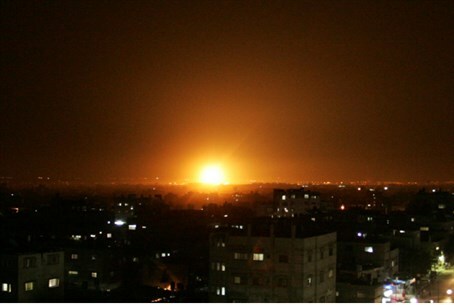 The Israel Air Force (IAF) on Saturday night launched airstrikes on ten targets in Gaza, in retaliation for the endless rocket attacks by Gazan terrorists on southern Israel. According to a statement from the IDF, the targets included concealed rocket launchers and a weapons manufacturing site. “The IDF is prepared to defend the citizens of Israel from any threat and will continue to act decisively and as long as necessary until calm is restored,” said the statement, which added that Hamas was responsible for the constant rocket attacks. Fifteen rockets and mortar rounds were fired at Israel on Saturday, lightly wounding one soldier and sending tens of thousands of Israeli civilians into bomb shelters. Most of the rockets fell in the Eshkol region; however, two reached as far as Be'er Sheva. Of those two, one was shot down by the Iron Dome anti-missile defense system, and the other exploded in an empty field. Little to no progress has been made in rumored talks between Israel and Hamas since Friday, which were allegedly mediated by Egypt to broker a ceasefire. Hamas has been ignoring the IDF's ultimatum, which on Thursday called to stop the rocket fire within 48 hours or face war.